OOk this is one of my most favorite, tried and true, best recipes. This is the one I trot out when I want to impress and have my friends begging for more. It’s creamy, it is just spicy enough, it is fabulous. I will be honest and say I don’t remember who I got this recipe from. Maybe my friend Leia, aka Ned, the one who gave me the crawfish pie recipe but maybe it was my sister? I truly cannot remember and if you know me at all, you know how rare that is. I have a memory like an elephant. I remember it was in college, maybe grad school, and I made it a whole bunch. Anytime my friends and I cooked supper together, this was usually one of the menu items. My friend Cara and I and her roommate Nicole would have this every other week one summer. At the time it seemed like the best recipe in the whole world and so elegant…in some ways it is still that way to me. My little girl, ADB, has loved this for a while and it is probably one of her favorites. So the tradition continues. This recipe deserves all the props it gets, I promise. It’s just that good. I don’t even know where this recipe is written down on paper! I just know it by heart. I guess all important things that have special memories attached to them are etched on your heart. This recipe certainly qualifies. If you gave me this recipe and you read this post please give me a shout out. I love to give credit where credit is due and y’all know I love to share stories about friends who the recipe comes from. 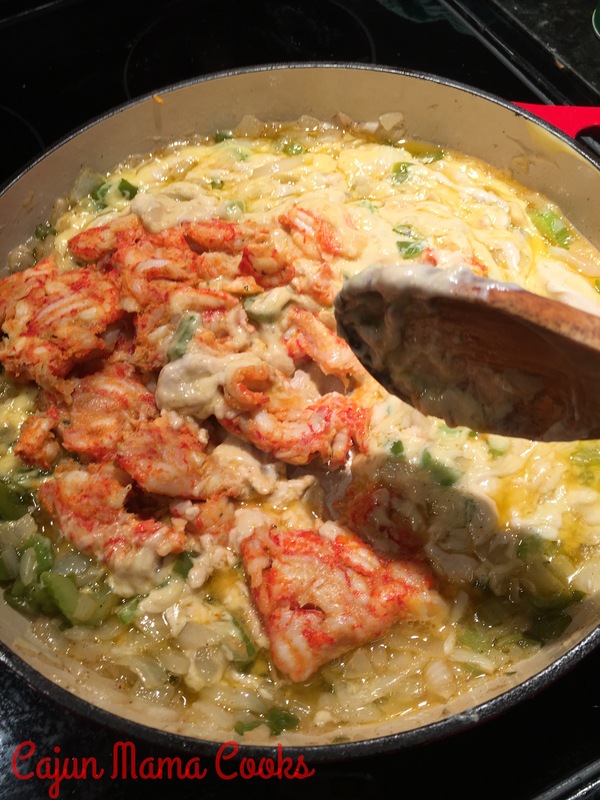 None the less, just make this crawfish fettucine and enjoy! This pairs beautifully with a green salad and some garlic bread. Hope y’all enjoy it as much as I have for the longest time now. Grab a good bottle of wine, make this recipe and toast to good friends, wonderful memories, and great food! Nothing better! Melt your butter in a big ole skillet over medium heat. 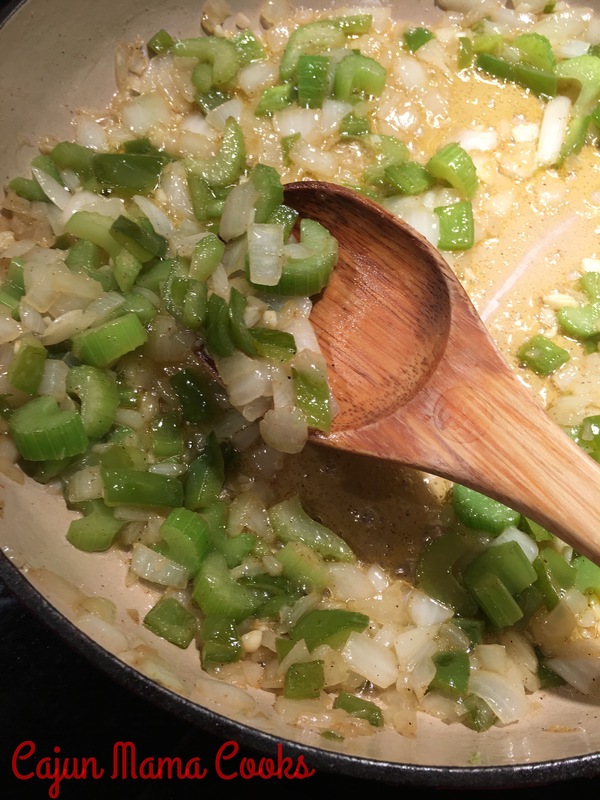 Sauté the onion, bell pepper, and celery in the butter until tender. Sprinkle in a little Tony’s at this point. I read somewhere a while back that adding seasoning at the beginning of the sautéing process tends to deepen the flavor of the seasoning. Works for me! Add the minced garlic and sauté another minute or two. Next add your soups and crawfish tails. Add your cubed up velveeta and cook over low heat, stirring frequently. 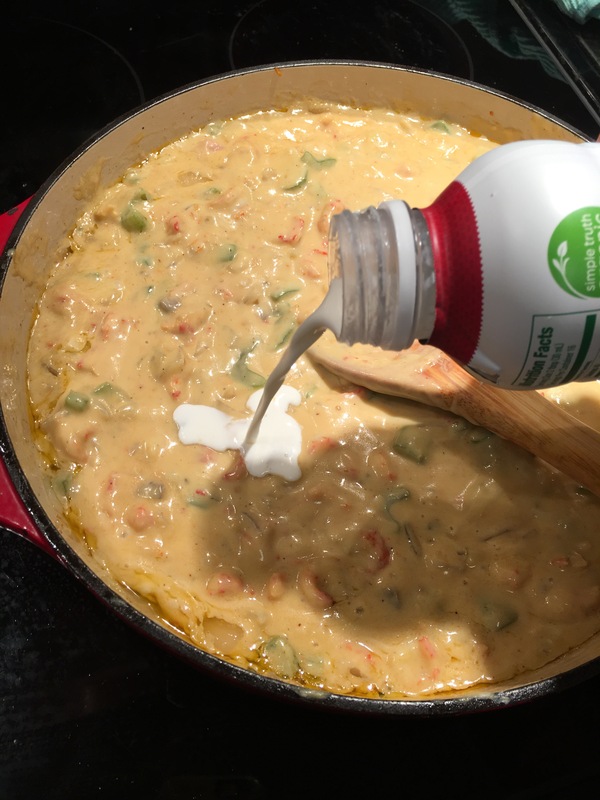 Next, add a splash of half and half to make this luscious concoction that much creamier. Add a little more because it makes it that much better. Stir, stir, stir. Continue to cook over low heat until the sauce is the consistency you prefer. It will continue to thicken some after you remove it from the heat. Keep that in mind. Serve over some cooked fettucine noodles along side some garlic bread to sop up all that sauce the noodles forget. Best. Stuff. Ever!!!!! 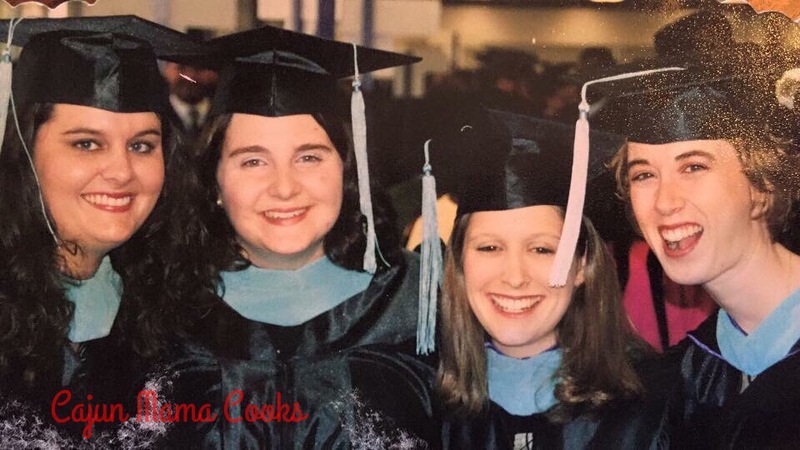 speaking of favorites from my grad school days…still love these ladies. blessed to call them friends. About how many does this recipe serve? Making it tonight with some leftover crawfish tails we peeled and froze about a week ago. Sounds wonderful! Thanks for sharing!!! Are you related to Brian Blanchard? If so email me at david.gansauer@windstream.com and thank you in advance. I have a recipe very similar and this is a FAVORITE! Since my husband prefers his over rice, I thin some for me and eat it as soup with plenty of crusty bread for dunking…salivating! Yes!!! I like the way you think! the online recipe has an asterisk on the crawfish tails, but it doesn’t seem to refer to anything — there’s no footnote. Are the tails cooked before they go in the dish? I’m sorry! What that means is I buy Louisiana crawfish tails whenever possible. (I’m certain that is what I meant to put) and no just cut the package of tails open and pour into the sauce! Made this tonight and it was delicious! We just love Cajun food! It is so good!!! I’m glad y’all enjoyed! I cannot wait to make It again! 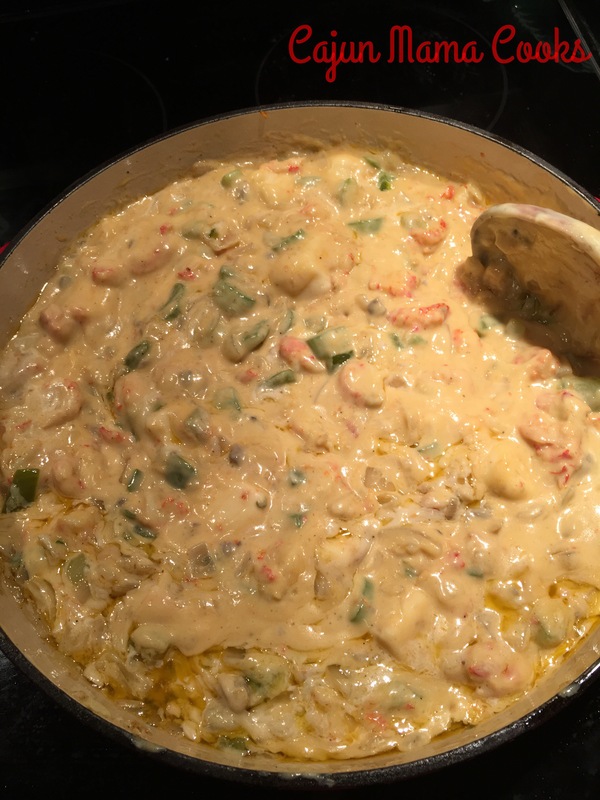 Could I add shrimp and sausage to the recipe as well or have you ever added another meat to the recipe besides crawfish? You surely could! I’ve never done it but I am sure some shrimp and or sausage would be great! We made this recipe this weekend. Can I just say SCRUMPTDELIOUSHUS!!! Next time we will chop us some mushrooms to add to this as well! I can see substituting the crawfish with shrimp or lump crab meat, yuuuuuuuum yum!! Yes that sounds fabulous!!! Try the corn crab bisque recipe I have on here! I’m adding crawfish and crabmeat next time. So glad you enjoyed!! Thanks for letting me know. The best ever. I’m from Houma, La. This is the best ever. I LOVE that you think so!! Thanks Marjorie!! Swamp People are loved by this Weekend Texas girl! Unfortunately, I need to know the nutritional info before I try a recipe. I understand Margaret. This is one of those dishes though where it’s best not to know all that information. It’s to be eaten and enjoyed with abandon. I can try to figure it out and let you know though. I encourage you to try it anyway. It’s amazing.